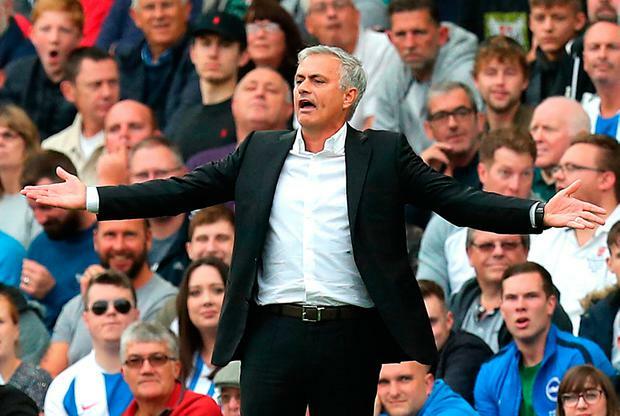 Manchester United manager Jose Mourinho gestures on the touchline during the Premier League match at the AMEX Stadium, Brighton. Sunday August 19, 2018. Gareth Fuller/PA Wire. Jose Mourinho has refused to be drawn on the confession from Paul Pogba that his attitude was poor in Manchester United's 3-2 defeat against Brighton last Sunday. After a summer of speculation linking Pogba with a move away from United - with those rumours fuelled by the player's agent Mino Raiola - Mourinho named Pogba as captain for his side's first two game of the new Premier League season, yet his comments after the Brighton loss caused a stir. "The attitude is not how we want it to be. I think it showed on the pitch, with myself first, the attitude was not good enough. We keep trying," stated Pogba. The comments saw the France World Cup winner come under fire from United legend Paul Scholes, yet Mourinho insisted reporters needed to get answer from Pogba on why his attitude was wrong as he spoke to the media ahead of Monday's game against Tottenham. "Paul said it and he has to answer by his words," declared Mourinho. "If you want any explanation about Paul’s words you must get him and ask him. A tetchy Mourinho was also asked to comment on reports that his relationship with United CEO Ed Woodward has been strained following a transfer window that did not see the central defenders Mourinho asked for arriving at Old Trafford. Insisting he did not have any problems with Woodward, he was asked whether he was still enjoying a good working relationship with the CEO and replied: "Of course." Mourinho also stressed he was in optimistic mood ahead of a vital game against Spurs, as he suggested the media were being a little too pessimistic about his side's hopes. "I think difficult, after the match you lose, is always difficult, especially for people that really care about the job, about being football professionals, but after that you think about the next match," he added. "You do the same when you win, when you win you have to move on and focus on what's next and imagine when you lose you have to do even more. "You have to play against 19 opponents at Old Trafford and away, you have to play against everyone, I don't know if it's the right time. "The time is now, the fixtures were decided this way and we have to play Tottenham Hotspur in the second match at Old Trafford and then we go away twice in a row to Burnley and Watford. This is what it is and of course it's a difficult match, a team that last season finished in top four. So a difficult match."